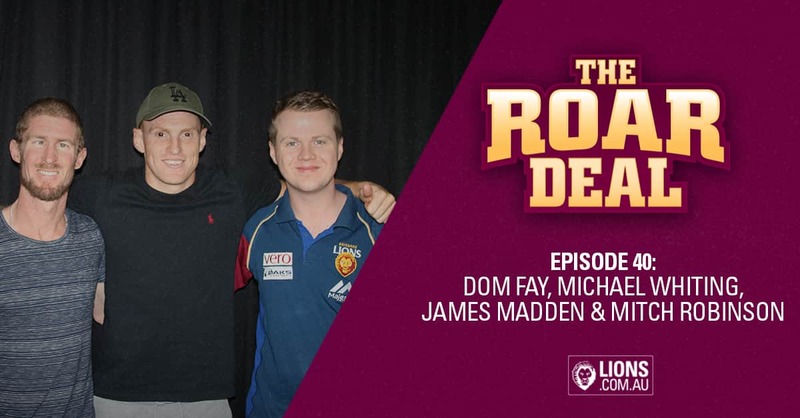 Fan-favourite Mitch Robinson (@24.12) is the latest guest on the 40th episode of the Roar Deal with hosts Dom Fay and Michael Whiting. After missing the majority of the 2017 season with a broken foot, Robbo has been one of the Lions’ most consistent performers in 2018, only missing three matches. He collected 21 disposals in last weekend’s fiery clash against the Suns and said he loved the fight between the two sides. “When I was at Carlton we had a lot of rivalries between Essendon, Collingwood and Richmond,” Robinson said. “It didn’t really matter where you were on the ladder, it was going to be a good battle. “That’s what I felt like with the Suns – it’s going to be a good game regardless of where we are on the ladder. Having spent plenty of time as a tagger, Robbo could relate to what Dayne Zorko felt like on the weekend when Suns' tagger Touk Miller spent the match running with him. “I’m sick of hearing about those two blokes,” Robinson joked. “You’ve got to look at it from both sides. I know exactly what Touk would have been doing during the game and that goes unnoticed. Nearing the end of his fourth season at the Lions, Robbo is out of contract but confident of signing a new deal at the Club. “There’s an offer on the table which is really good to know I have security. I just need to keep playing good footy and it will sort itself out. “I’ve spoken to Fages and he wants me here for the next two years. We will see how it pans out. I’m not too worried. In his open and honest chat with Fay and Whiting, Robbo also talked about the match review fines he has received in 2018, his role in bringing Charlie Cameron to the Lions and what the team needs in the upcoming trade and draft period. New Irish recruit James Madden (@53.36) stopped by for his first appearance on the Roar Deal podcast. Madden grew up in Dublin and has been playing Gaelic Football and Hurling at a high level for the last few years. "It's a nice place [Dublin]. It's pretty cold in winter at times - this year we had a ton of snow. We had a curfew where we had to be in early because no one was prepared for the blizzards," Madden said. "I played one soccer match in the life and it didn't go well. "I did the AFL Combine in December last year and nailed it. I went to Florida with the AFL Academy which was really hard. I wasn't sure if I really wanted to do it after that. "After coming home and settling down, I realised it was something I was really interested in trying out." Madden has been in Brisbane for two weeks now and discussed how he has found the Club and the transition to AFL so far. "It's been good. I've been staying with Harris, Hugh and Jarrod. It's a pretty nice house, but the pool if filthy at the moment...Harris refuses to clean it." "I have a bit of a sore ankle so I've been running a lot of laps. "Scott Borlace [the Lions' Head of Development] said my kicking is better than Pearce Hanley when he started here. "I'll be back here a couple of weeks before pre-season training so I can get used to the heat. It's only winter but it's still pretty hot here. "There's a lot of young lads in Ireland who would love this opportunity and I'm going to relish it. I'm delighted to be here."